Left-right: Prof Tim Woodman, Head of the School of Sport, Health & Exercise Science; Prof John G Hughes, Bangor University Vice-Chancellor; Steve Davies MBE, Chief Executive, Surf Snowdonia; Phil Nelson, Business Development Director, Surf Snowdonia.Bangor University and Surf Snowdonia have signed a Memorandum of Understanding which will pave the way for working together on a range of exciting new opportunities and initiatives. Surf Snowdonia’s Wavegarden® is a revolutionary, world-first, inland surf lagoon located in the foothills of Snowdonia in the beautiful Conwy Valley. At the push of a button, the Wavegarden will generate perfectly formed barrelling waves which will interact with contours on the bed of the lagoon to provide different wave profiles at different points in the lagoon. Up to 52 surfers at a time will be able to ride the waves, with different areas of the lagoon suitable for different abilities. The agreement, signed by Bangor University’s Vice Chancellor, Prof John Hughes and Surf Snowdonia’s Managing Director, Steve Davies MBE, will see collaboration and support for joint research in areas such as sporting performance, environmental management and the role that sport can play in public health, well-being and in exercise rehabilitation. Both organisations have also agreed to work together to examine benefits for students that could arise from, for example, work and study placements at the site as well as from using the facility as a base for the University’s Surfing Club, learning and participating in the sport and for hosting events and competitions. In making the announcement, Steve Davies MBE, Managing Director of Surf Snowdonia stressed the importance of the relationship with Bangor University for his company. 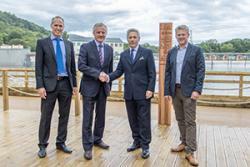 Prof John G Hughes, Bangor University’s Vice Chancellor also welcomed his University’s collaboration with Surf Snowdonia. “To have such an innovative and high profile new business on our doorstep that is eager to work with the University is great news for our researchers and for our students. The outstanding quality of the natural environment and the diversity of local outdoor activities attract many of our staff and students to Bangor University. Being able to apply our research and teaching strengths in areas such sports science, elite performance and sports psychology, amongst other things, in collaboration with Surf Snowdonia, opens up a number of exciting new avenues for ourselves, our students and for the company”. With Surf Snowdonia conservatively expected to attract in excess of 75,000 visitors per year to North Wales, create over 110 direct and sustain around 100 further jobs in the supply chain, both organisations hope to see a productive long term relationship develop which will bring benefits for all involved.